Among natural stone countertop materials, granite has long been the most popular option, thanks to its attractive appearance and durability. By comparison, slate countertops are much more understated in appearance and not quite as robust in terms of durability, but they offer significant advantages over granite counters with regard to cost and maintenance requirements. Granite countertops are heat and scratch resistant. Granite is an igneous rock composed of grains of different minerals, including quartz, feldspar and mica. Because its mineral composition varies widely, granite is available in a wide range of colors, from bold blues and reds to more subtle blacks and browns. Slate, a layered metamorphic rock formed when shale or mudstone is subjected to pressure, occurs in a limited range of colors, which are relatively subdued compared to those of granite. Most slate is gray or black, but some variations have a subtle hint of green, red or purple. The surface of a granite countertop seems hard and smooth, but it's actually porous and can absorb spills and stains. Granite counters are usually treated with a sealant during the manufacturing process to make them more stain resistant. Cleaning a granite counter with abrasive or acidic cleaners will shorten the life of the sealant, and even in the best of circumstances, the counter will require regular resealing. Slate is nonporous, so it doesn't absorb stains the same way that granite does, and it doesn't require periodic sealing. Granite is extremely hard and dense, so it is very resistant to scratches from knives, pots and anything else it might encounter during everyday use. It also holds up very well to heat. Slate is also heat resistant, but it's softer than granite, so it's susceptible to scratches; buffing with steel wool can remove some minor scratches. Slate is also relatively brittle, making it vulnerable to chipping along edges and at corners. All natural stone countertop materials are expensive compared to lower-end man-made materials. 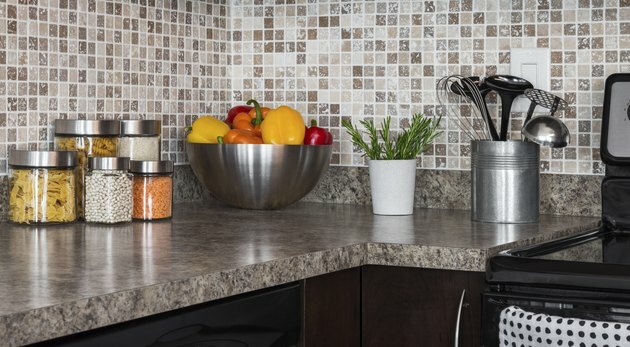 The cost of granite varies significantly depending on the region, the variety of stone and the design of the countertop, but at the time of publication granite countertops typically cost from around $50 to about $270 per square foot installed. Slate is usually less expensive; the typical cost for a slate countertop as of publication is comparable to that of low-end granite, at around $50 to $65 per square foot.